TVS Motor Company has launched a brand new commuter motorcycle in the Indian market today to consolidate its entry-level portfolio comprising of Sport, Victor and Star City Plus. 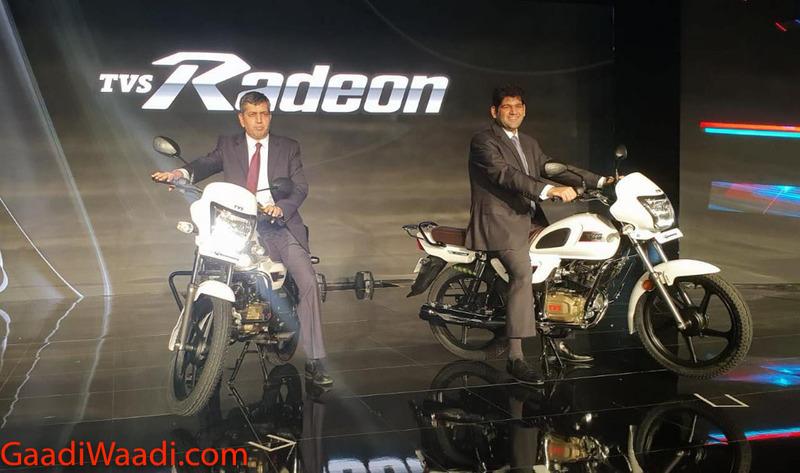 Introduced at the official event hosted in Chennai, the production Radeon comes more than four and a half years after its 125 cc concept broke cover at the 2012 Auto Expo. Even after TVS announced the launch date of a brand new model a few weeks ago, none saw it coming as the Radeon remained in the speculative stage for long. 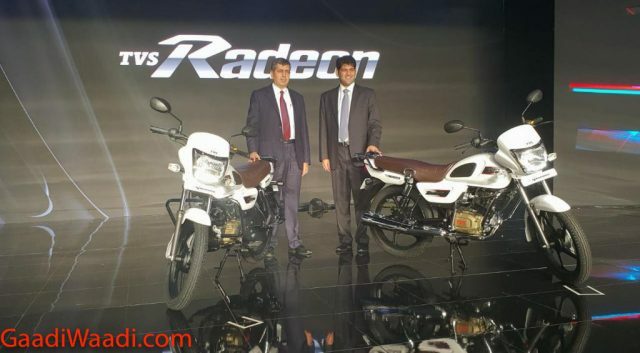 It is part of the Hosur-based brand’s aggressive strategy to enter into new segments and strengthen its position in the existing ones, as the flagship RR310 naked supersport was followed by Ntorq 125 premium scooter and Apache RTR 160 4V before the Radeon. TVS’ latest launch spree denotes its intention to enter into varying segments and the Radeon is no exception. Placed in an aggressive price bracket at Rs. 48,400 (ex-showroom, New Delhi) with several segment-first features, the Radeon is testament to the fact that TVS is not giving up on the volume-based entry-level commuter segment just yet as “sturdy metal build, robust style and plush comfort” have been emphasised. TVS says the Radeon is for the “confident self-made” Indian and has a functional design with practicality and durability in tact. Built on a steel tubular chassis, the TVS Radeon has a contemporary design with distinctive presence to not only stand out from TVS’ domestic portfolio but among its competitors as well. It comes equipped with first-in-class Synchronized Braking Technology that is said to ensure superior braking control and minimal skidding. The side stand indicator beeps when rider forgets to disengage it and it is a helpful feature in avoiding accidents. The Radeon is bolted with 18-inch black alloy wheels with Dural Grip tyres. TVS claims that the Radeon has the largest cushioned seat in the segment while the telescopic front forks, with five-step adjustable rear hydraulic shock, aids in comfort during long saddle times. Focussing more on comfort, the Radeon boasts a wheelbase of 1,265 mm and has high ground clearance at 180 mm. It gains low seat height, USB charging spot, easy-to-grab rail for pillion, self start function, etc. TVS has added chrome accents to the sleek yet appealing design for increased premium appeal and it has a robust presence in deed. Other important features are integrated Daytime Running Lights, headlight with chrome bezel, clean design for the 10-litre petrol tank with unique thigh pads, and speedometer, silencer and shock absorber finished in chrome among others. Sold in a total of four colour options: White, Purple, Beige and Black, the TVS Radeon gets five-year warranty and is powered by the in-house developed 109.7 cc single-cylinder, Dura-Life engine which is good enough to produce a maximum power output of 8.4 PS at 7,000 rpm and 8.7 Nm of peak torque delivered at 5,000 rpm. It has ARAI-claimed fuel efficiency of 69.3 kmpl. With deliveries expected to commence from next year, TVS is targetting two-lakh sales in Radeon’s first year.